We’re running late. The Piccadilly traffic stands still, a glistening of red rubies not unlike something I’d seen in a jewellery store window. Bathed in the cool white glow of the famous Piccadilly Circus screens, this would normally be one of my favourite city scenes. But not tonight, not when we’re running late. 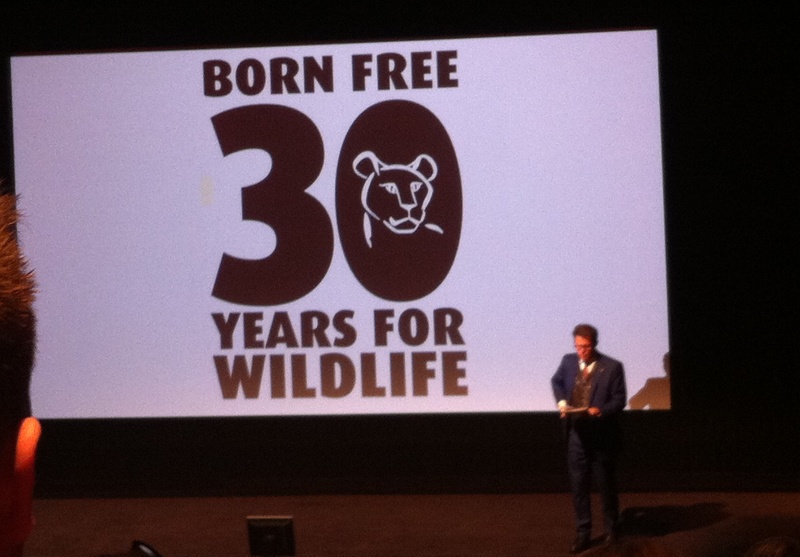 “It’s 30 years since Born Free Foundation began. 25 years since the wise, gentle George Adamson was murdered. Tugging at the doors of BAFTA, 195 Piccadilly, they moved just a couple of millimetres before falling back on the themselves forcefully. It’s locked? I find two buttons, one is for automatic wheelchair access, one for calling reception. I press both, instantaneously. One has to work. “But 30 years for wildlife, and here we are, all together. The Born Free generation”. We applaud loudly and I’m grinning like a baffoon as Will Travers OBE descends the stage and returns to his seat beside his mother; Virginia McKenna OBE. I’ve seen him in countless newsletters and leaflets but he’s taller than I’d imagined. More studious looking. “The Born Free generation” I repeat in my mind. I agree. I’m 23 and this film and it’s namesake charity have always been a part of my growing up. In my life like a family member. Adoption packs, letters, bags for old ink cartridges, a pile of used stamps I’ve been meaning to send. A bookcase with a shelf filled with various editions of stories from and about the Adamsons; the films – DVDs next to VHS’ that I refuse to part with. A stuffed toy of Aslan sits next to a framed photograph in which I’m laughing with my Shamwari volunteer workmates as we sat across the wooden benches of the Julie Ward Education centre. A black and white poster of Joy sitting over Elsa as she’s rolling on her back, more like a dog than a lioness. Five seconds in my room and it’s undeniable. I’m one of the Born Free generation. The door swings open slowly but at just the right speed to drink each feature in at a rate I can process. 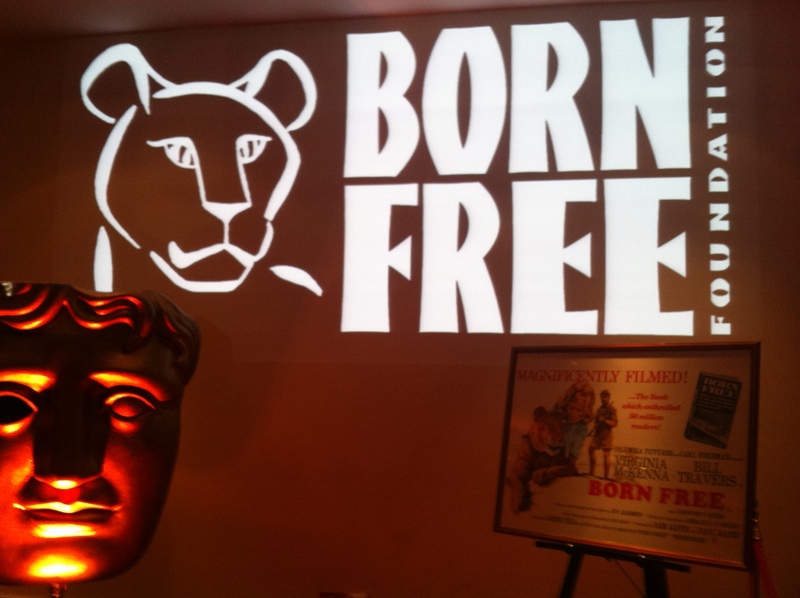 A screen above an elevator has the comfortingly familiar Born Free Foundation logo (phew. We are in the right place). A golden face, the symbol of BAFTA stares out from the first half of a staircase, and there at the foot of the stairs a small white plague, humbly announcing the 30th Anniversary ‘Wild Night at the Movies’. I check the time of my phone – 7.31. We’re not doing too badly. I hear the soft crunching of popcorn as a commotion breaks out on screen. The editing is a little more jumpy than I remember, and the speed of the frames as a man-eating lion runs into the gun fire of Bill Travers’ portrayal of George is faster than I expected. But it’s perfect. Charming, dramatic, nostalgic. At the top of the staircase, passed the reception, we walk into the David Lean room. Large banners and merchandise stalls greet us. I can breathe again now. I smile as we’re handed a glass of Wild Thing wine and drink in the room as well as the sweetness of the wine. There are familiar faces all around — one of Born Free Foundation’s most passionate campaigners; Helen Worth (Coronation Street’s Gail Platt), soap nasty John Altman (Eastenders’ Nick Cotton) to name drop just a couple. “If you’d like to make your way into the auditorium…” a voice calls out. Will Travers steps aside with a smile and a “after you”, before I’ve even realised who I’ve slid past. At least I was gracious enough to allow whoever was about to step out of the elevator to enter the auditorium before me. 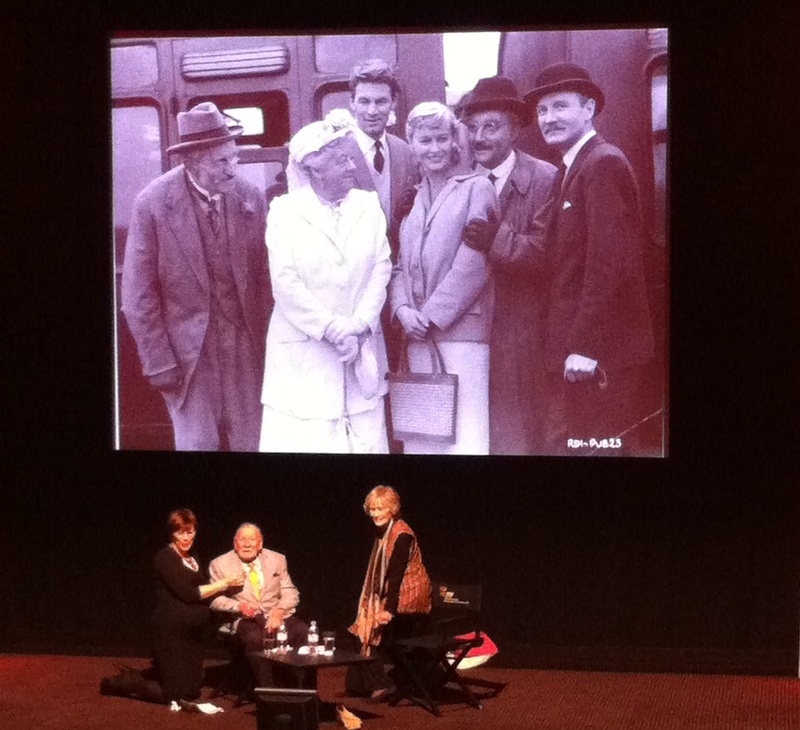 It turned out to be Leslie Phillips CBE and his beautiful wife. Is this night for real? George Adamson: I don’t know what goes on in that head of yours anymore… What’s wrong with a zoo, anyway? Joy Adamson: Nothing. Except that she won’t be free. George Adamson: and Is freedom so important? 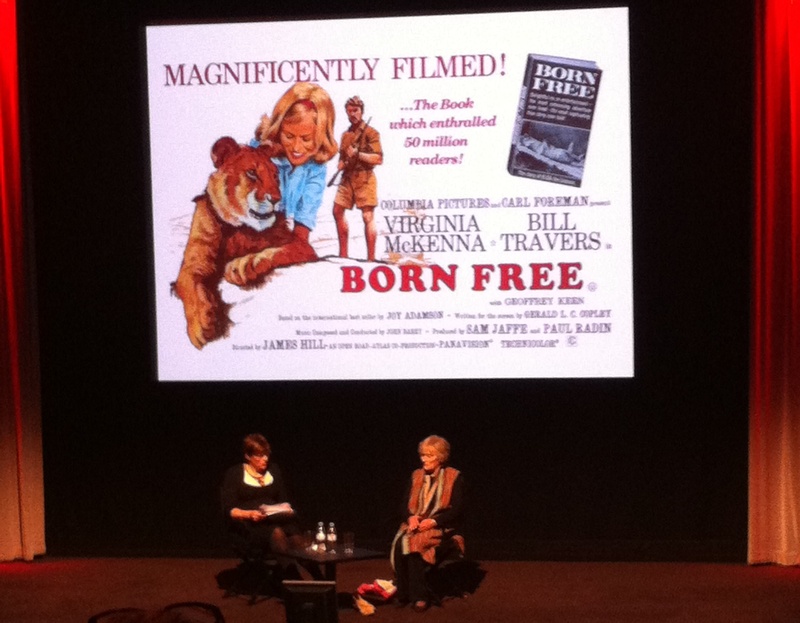 Joy Adamson: Yes, yes, she was born free and she has the right to live free. Why don’t we live in a more comfortable setting George? Other people do. We chose to live out here cause it represents freedom for us. Because we can breathe. With all the grace and elegance I’ve come to associate with her on-screen presence, Virginia spent the next hour talking us through her life and career before and beyond the Born Free film (with a little help from Mr Phillips): expertly guided through the questions of a blossoming Kate Silverton (who vows that when she goes into labour she will have the film’s theme song on her ‘birthing playlist’, just like she did with her first child!). I was staggered to learn that this is only the second time that Virginia has watched the film, and that the song nearly didn’t make it into the final cut as the producers ‘weren’t convinced’ at first. As the iconic first line of John Barry’s “Born free, as free as the wind blows…” fills the auditorium I try to swallow the lump in my throat. It’s been building up since Bill Travers delivered the line: “You must be very proud”. Given the circumstances, it’s so poignant. 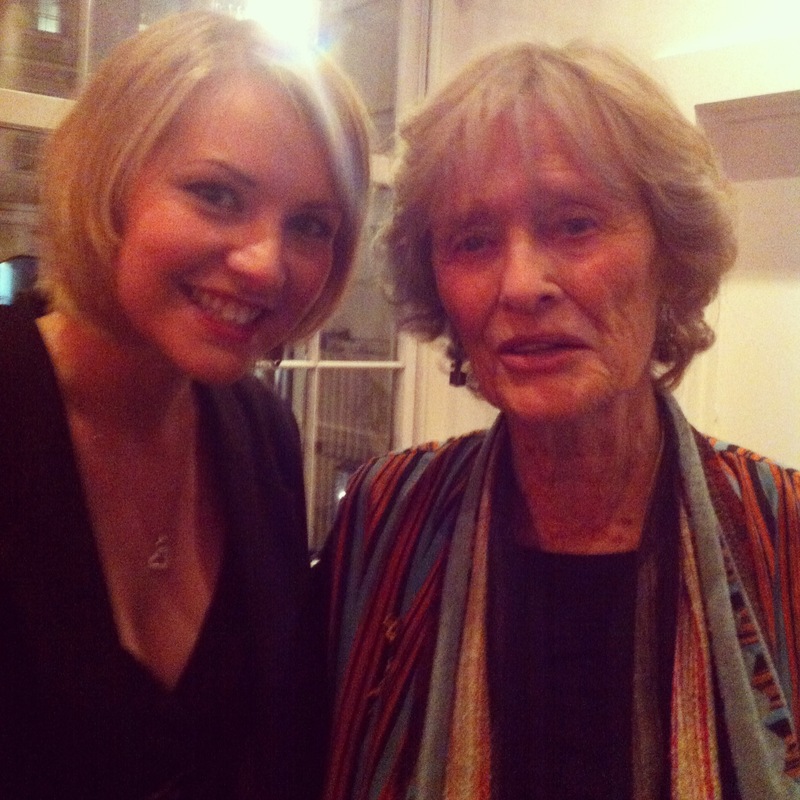 I think everyone in the room feels both proud and inspired by Virginia Mckenna and I think to myself how proud Bill would have been of all that Virginia and Will have achieved through Born Free in the two decades since his passing. “I’m proud of her” the character of Joy Adamson responds. All too soon — to the roaring sound of a passionate and heart-felt standing ovation for Virginia — my dream evening was coming to a close. But I had a lot of long-lasting thoughts to take home with me. What next? What will happen over the next 30 years? Will the animals still be free? Want to know more about the Born Free Rescue Centre at Shamwari?